1. Are you "complementarian"or "egalitarian" regarding gender roles? Both in the church and at home, we believe that gifting is the criteria for leadership, not gender. We are committed to egalitarian theology and practice. Here are some helpful resources: "Husbands, Crucify Your Privilege: Ephesians 5 & How Men Take the Lead" (on marriage) and "N.T. Wright on Why Women SHOULD be in Pastoral Roles" (on women in ministry). Our family of churches, the BIC, ordains women for all ministry posts including the office of bishop. 2. What is an Anabaptist? Although nuanced understandings and applications of that tradition exist, Pangea is Anabaptist in two ways. First, our sending denominational family, the Brethren in Christ, is rooted in Anabaptism. Second, many people who have joined up with us might be considered "neo-Anabaptists." Basically, these are folks who identify with values such as nonviolence/social justice, Christian community, and a Jesus-looking God. To understand the basics of Anabaptist Christianity, go to our Convictions page. To go slightly deeper, Stuart Murray's The Naked Anabaptist: The Bare Essentials of Radical Faith is a great introduction. Ultimately, we are followers of Jesus and Anabaptism is one of several Christian expressions that influences the values of Pangea. 3. What other traditions influence Pangea? Too many to count! Progressive forms of evangelicalism (not the sort on the news! ), Eastern Orthodoxy, Roman Catholicism, Anglicanism (lots of influence! ), Wesleyanism, missional/emerging church, and so much more. We have a strong commitment to ecumenical relationships (to our theological left and right) and see ourselves in fidelity with all Christians who rally around the centrality of the bodily resurrection of Christ, along with the basic beliefs expressed by the Apostles' Creed (whether or not they consider themselves "creedal"). We consider ourselves thoroughly within the broad family of historical orthodox Christianity. 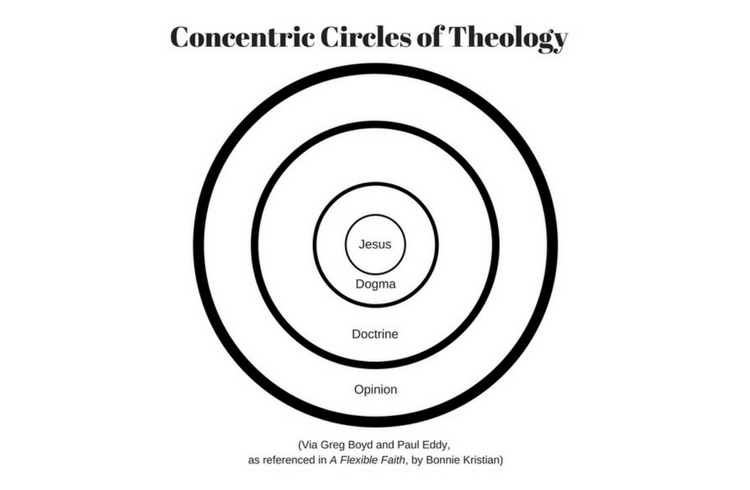 The way we discuss our approach to theology is best illustrated by concentric circles of importance. Jesus is our common center. Dogma (matters of orthodoxy which all historic Christians affirm) come next. Convictions (doctrinal issues that set forth our theological and spiritual identity) come after that. Then, matters of opinion (where we bear with each other in love). Of course, no matter where someone lands on any of these matters, they are always welcome and wanted at our church. 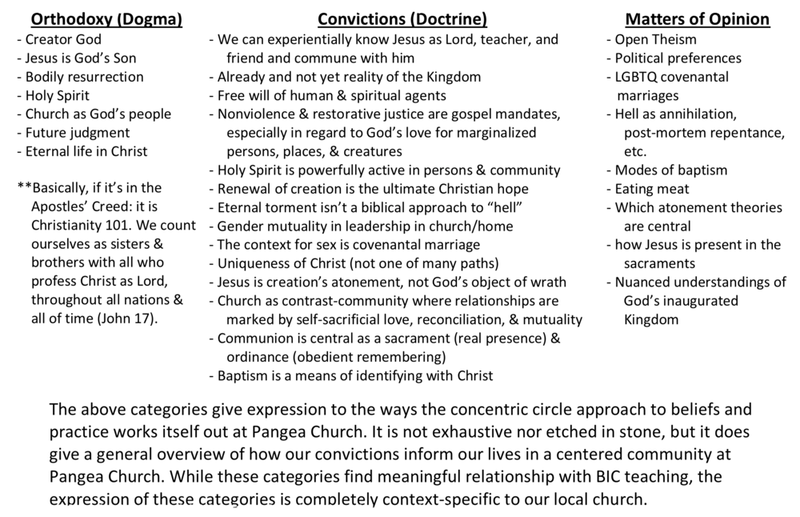 This simply frames how we talk about theology and convictions at Pangea. 4. Do you have formal membership? Not at this time. We are currently discerning what this will look like for us. Although we highly value relationship to our denominational family (and gladly consider ourselves a "member" church), some of us are uncertain about membership as a concept (a. If it fits our context; b. If it fits our theology). We plan to have a way for committed folks to adopt shared local values/commitments/rhythms in the future, but these will likely be something more like missional/monastic orders. If that becomes referred to as "membership," we will need to update the response to this question! haha. 5. Who may get involved in serving and participating at Pangea? Is "inclusion" just a buzzword? Anyone can be active participants and "inclusion" isn't a word we use to sound cool! Our value, "inclusion," means that all are invited to be active in our church. We create space for Christians of differing viewpoints in "nonessential" theological convictions (open theism vs simple foreknowledge, LGBTQ marriage (for more info), atonement theories, etc.) to worship Christ and serve the common good. We consider ourselves a "third way" community, meaning that people of differing convictions (often framed as "this or that" or "black and white" in two-option binaries) on disputable matters can worship God and serve humanity side-by-side. Additionally, many roles at Pangea (either on Sunday mornings or in a Village group) don't even require a Christian commitment (although we're always up for a good conversation about Jesus and baptism). For those in "teaching" roles, we ask that a person evidence teaching gifts, share our 5 core values, and demonstrate a commitment to following Jesus Christ as the ultimate revelation of God. *Please note that all children's workers will be required to pass a background check. 6. Are you "Reformed," as in the "young, restless, and reformed" movement (sometimes called "neo-reformed")? No, we are not. We differ in areas related to women's roles, atonement theology, and just about every letter on the famous "TULIP" acronym. We do consider them our sisters and brothers in Christ, but we are also quite different in some obvious ways. 7. Do you have specific ministries for women (Women's Ministry), men (Men's Ministry), etc.? The short answer is no. We don't plan to have many programs. Imagine that all of the functions that various programs play in a typical "attractional" church model have been redefined around grassroots communities of Jesus followers (and seeker/skeptic types) called Villages. Within these localized communities the participants dream up what it looks like to express God's kingdom of love within their neighborhood and world. This may lead to some things that mirror "programs," but may not. Even so, our resources flow into Villages instead of program silos that can easily become disconnected to the broader vision of a church. 8. I like to "nerd out" on theology. I realize that regular church services aren't the ideal place for this (although, at Pangea, we do get heavy sometimes). Is there a space for me to process relevant theological issues with others? Yes! Somewhat organically we have created something we call "Beer:Bible:Book" nights. Together, those who participate agree to read a specific book (or other resources) pertaining to a relevant theological/missional topic. They then all come together at someone's house, bearing beverages and snacks, to process the material and its ramifications for missional living. Some previous topics (which may be returned to in the future) include: the significance of the Eucharist, Hell, nonviolence, and incarnational mission. We will announce these events in our Sunday Gathering, including the topics and readings required. They are organized somewhat sporadically, a few times each year. 9. What do you teach/practice regarding the "gifts of the Holy Spirit?" A short answer to a very complex question is that we affirm that God still uses the Holy Spirit in the lives of Christians to do the miraculous. Although you might not know it from our Sunday Gathering, we would consider ourselves to be somewhat charismatic. Much of the “charismatic” movement often gets a bad reputation because of some of the outrageous expressions that seem counter-productive to mission. Nevertheless, we believe that the power of God is available today insofar that God sees fit in a given situation. Although we reject the political and cultural baggage of much of the mainstream Pentecostal movement, we believe in the miraculous and long for it within our church communities. God can speak to people through dreams, visions, pictures, all forms of the prophetic, and words of knowledge; can empower people for acts of physical, emotional, and spiritual healing–even raising the dead; can give the ability to put Jesus on display through signs and wonders; can open up the eyes of some to see the unseen realm of reality; can speak to and through some people using unknown tongues; and can do whatever God pleases to move the mission forward through the people of God. 10. Why do you do liturgy? Aren't you Mennonites? The short answer is that we believe that something was lost (although much was gained) with the reformation. Pangea practices liturgy in continuity with ancient Judaism (Jesus said liturgies!) and the early church. We embrace a sacramental theology (rather than ordinance-based as in most "Anabaptist" churches). We believe the way forward is rooted in the beauty of the past. This is why one of our core values is Mystery. To learn more about our ancient-future worship impulse, read here. 11. Does Pangea consider itself a "peace church?" Is nonviolence a central teaching of the church? We do not expect that everyone at Pangea has this nonviolence thing "worked out." There are shades of grey, to be sure, even within the nonviolence camp. But it should be noted that we do teach "peacemaking" as a core value and nonviolence falls into our theological core convictions. All are welcome to worship with us. One need not see this as a hurdle to community, but an invitation to process a challenging teaching of Christ with others. For a theological exploration of Christian nonviolence, start with our essay, Nonviolence 101.